Which Is Better, Fitbit Versa vs Charge 2? Just like Fitbit versa, charge 2 also measures the continuous heart rate. Charge 2 also has the PurePulse technology that keeps tracking the heart rate. It also keeps a tab on all day activities like Fitbit versa. It tracks activities such as distance, steps, calories burned, active minutes, and more. Automatic sport recognition	 Versa has an automatic sport recognition feature. It displays caller ID and messages. Charge 2 also features automatic sport recognition. It has a SmartTrack technology to record and recognize the workout. ALARMS	 To grab your attention, the Versa vibrates when the set alarm goes off. To grab your attention, the charge 2 vibrates when the set alarm goes off. WATER RESISTANCE	 Versa is water resistant and swim-proof up to 50 meters. Charge 2 is not swim-proof. FLOORS CLIMBED	 Versa measures the floors climbed. Fitbit Charge 2 also records the floors climbed. REMINDER TO MOVE	 The Versa features a reminder to move mode. The function of this mode is to remind you to walk at least 250 steps each hour to help you reach your goal. You can adjust it as per your schedule or switch it to ‘do not disturb’ mode when you are busy in a meeting or some other work. The charge 2 also has a reminder to move feature just like Fitbit versa. It keeps reminding you to take 250 steps every hour. Similar to the Fitbit versa, it gives the liberty to the users to set the reminder or turn it on ‘do not disturb’ mode when busy. DESIGN & SCREEN	 Versa has a larger and clearer display as compared to charge 2. It is heavier. Charge 2 has a metal body with an elastomer band. It has a larger OLED display. Apart from tracking continuous heart rate, Fitbit versa also features sleep tracking. It tracks the sleep stages and how much time you spent in REM, deep, and light sleep. This improves the quality of sleep and wakes you up with an alarm. To calm your body, it also features the guided breathing session. It reduces the blood pressure, anxiety, and stress. The Fitbit charge 2 also tracks your sleep. Just like charge versa, charge 2 also records the sleep stages while you are asleep. It detects the time you spent on light, deep, and REM sleep and how much time you stay awake. It also has a guided breathing session feature that has a calming effect on your body. This feature reduces anxiety and stress. You need to pay more for the charcoal woven and rose color. The price of colors also varies. The gunmetal and lavender rose gold colors are a bit expensive and you have to pay a few more bucks. Charge 2 is also available in different sizes; small, large (6.7 – 7.1 inch), and small (5.5 – 6.1 inch). 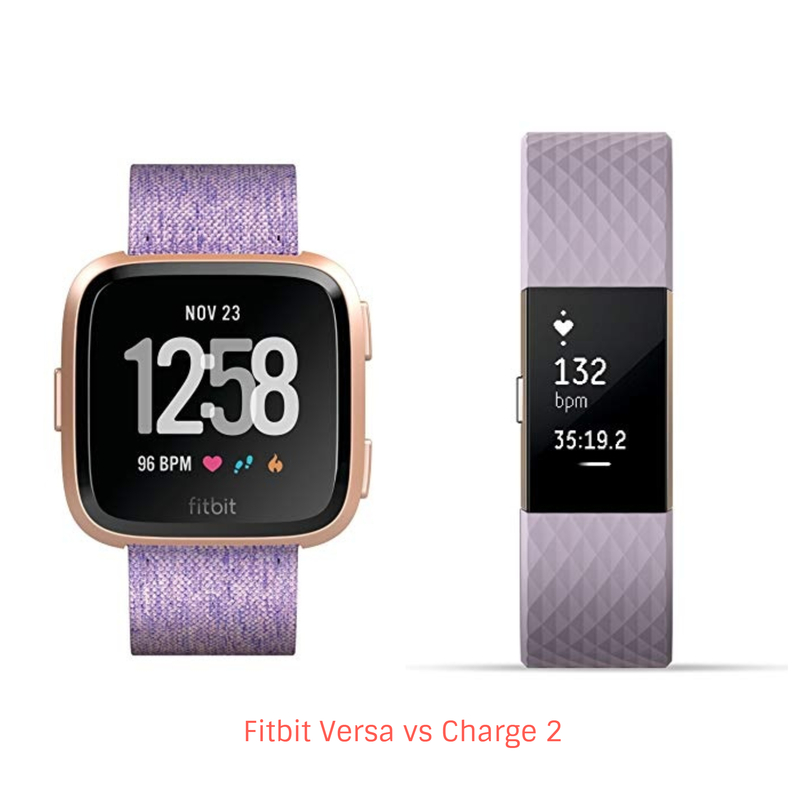 Fitbit Versa vs Charge 2, which one is better for you? After going through the Fitbit Versa vs Charge 2 comparison, we come to a conclusion that both have quite similar features except for a few. But, the quality and performance of both heart rate trackers are good. 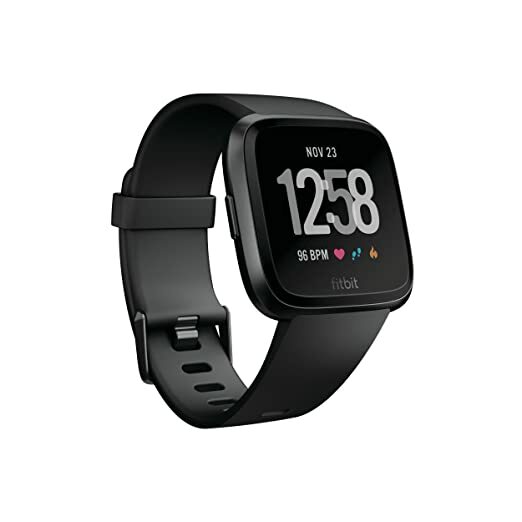 Fitbit Versa and Charge 2 keep a tab on your all-day activities, track heart rate 24 x 7, sleep stages, shows smartphone notifications, offers guided breathing sessions, and a reminder to move mode. Both fitness trackers also feature the SmartTrack auto exercise detection. Fitbit Versa offers some other features that Charge 2 lack. Versa is swim-proof and water resistance up to 50 meters. It also tracks swim. It also displays on-screen workout that is really helpful. Versa also allows you to store and control music. You can store more than 300+ songs. This music feature is not available in many fitness trackers and it makes the Fitbit versa set apart from other products. Versa also features female health tracking. Moreover, you can make the payments with the device because of the NFC chip. These are the similarities and dissimilarities between Versa and Charge 2. So, which one is better? If you want more features and a waterproof and swim-proof tracker, then Fitbit Versa is definitely a nice choice. 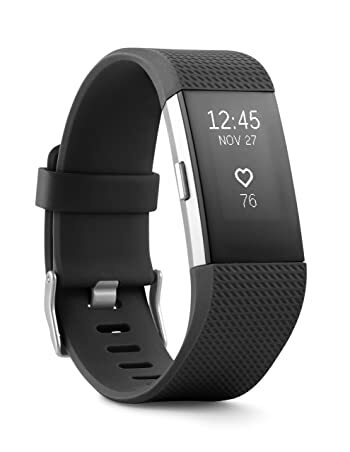 Women who want their tracker to have female health tracking also prefer Fitbit Versa. It is a bit expensive as compared to the charge 2, so for more features, you need to pay a few more bucks. That does not mean Charge 2 lacks in accuracy and quality. Charge 2 has been popular among the fitness enthusiast and that’s the reason it also received a tag of Amazon’s choice. Compared to the Fitbit Versa, Charge 2 is a simple yet the best heart rate tracker that offers many features but not as many as Versa. With the purchase of Fitbit charge 2, you will save some bucks. Plus, it has a good battery life. So, if you want to simply track your heart rate and all day activities and stay in budget, then charge 2 is a fitness device you should stick to.